Combine and heat to boiling. Line pan with foil- place ribs- cover with foil. Cook at 250 degrees for 2 hrs- remove foil and pour off liquid. Pour 1/2 of the sauce over ribs- baste with remaining 1/2. Cook 2 hrs. longer. Heat oven to 325°. In a large Dutch oven or kettle, heat olive oil over medium-high heat. Rub ribs all over with the seasoning blend then sear on all sides, about 2 minutes on each side. Remove the ribs and set aside. Add bacon to the pot and cook for about 3 to 4 minutes, or until cooked but not crisp. Add the onions and cook, stirring, for 2 minutes. Add the ribs back to the pot and add apple juice, beef broth, and cider vinegar; bring to a simmer. cover tightly and bake for 2 hours. Add the cabbage, cover, and continue cooking, basting occasionally, for about 30 to 45 minutes longer, or until cabbage is tender. Flavorful beef short ribs are tender and delicious in the slow cooker. Serve these short ribs with mashed potatoes and biscuits or rolls. Combine the mustard, honey and spices, mixing well. Rub the mustard plaster onto all sides of the sparerib slab. Smoke at 225 degrees Fahrenheit, with hickory for smoke. Continue to smoke until the ribs are tender and a crust is formed. Combine 2 tablespoons flour, the salt, and pepper in a bowl or food storage bag. Dredge or toss ribs with the flour mixture. Heat oil in large skillet over medium high heat; add ribs and brown on all sides. Pour off excess fat. In crockpot, combine ribs, onions, wine, chili sauce, brown suga, vinegar, Worcestershire sauce, mustard, and chili powder. Cover and cook on LOW for 7 to 9 hours. Turn to HIGH. Dissolve 2 tablespoons flour in 1 or 2 tablespoons flour. Stir into crockpot. Cook on HIGH for about 10 to 15 minutes longer, or until slightly thickened. Serve with noodles or rice. Preheat oven to 325 degrees. Combine all ingredients except the ribs in a large bowl. Blend well. Sprinkle ribs with pepper and additional salt. Place in 5 qt. roasting pan in double layer. Roast 1 hour. Pour sauce over ribs. Increase heat to 350 degrees and bake until ribs just begin to char on top, about 1 1/2 hours. Turn ribs over cover pan and bake about 30 minutes longer, until ribs are tender and sauce is thick. To serve, place ribs on serving platter. Pour sauce over ribs. Makes about 6 servings. Trim skin and any thick fat from 5 to 6 pounds of boar ribs. In a fry pan (or cast iron skillet), sauté' 1 medium chopped onion in a half a stick of melted butter until soft. Add 1 C Ketchup, 1 T. Worcestershire Sauce and 2 tsp. lemon juice. Heat through to let flavors marinate. Add some water if you think it is too thick. Place ribs over an open fire with low flames that has been burning for a while and cook slowly for about one hour, basting and turning frequently until well done. Serve with baked beans and biscuits on a stick. Pour over ribs. If cooking large amount and it does not look like enough sauce just add another can of tomato soup. Cook 7 - 10 hours on low. Meat will be tender and falling off bone. 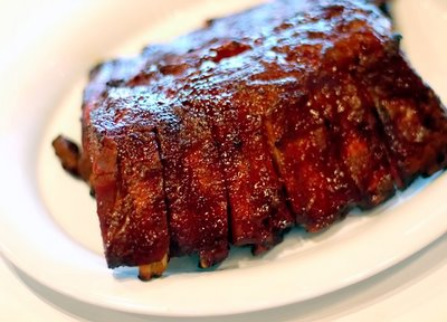 Cut ribs into portion size 3 – 6 ribs per serving, bring large pot of water to boil and turn down to low boil. Put ribs, thyme, salt and pepper in water and boil slowly for about 1 hour. Meat is tender but not falling off bones. Put all remaining ingredients into bowl and stir to disolve sugar. Add ribs, make sure all are covered by marinade. Let ribs stand in marinade at room temperature for 30 minutes Grill over medium heat, turn and baste will marinade often for 15 – 20 mins until sizzling and glazed.